Just when I think I have tricked intellij into accepting that I want to ignore that auto completion string INTELLIJ_IDEA_RULEZ, something else goes wrong. I might have to accept defeat, given that I have beaten my head against this for over a week now. Does anybody know how I can turn off auto completion completely? There are so many threads going on, doing invokeLater, that I can't look back up in the stack to figure out who is triggering the second parse. Second lexing/parsing is invoked just after inserting DUMMY_IDENTIFIER (com.intellij.codeInsight.completion.CodeCompletionHandlerBase#insertDummyIdentifier). AFAIK there is no posibility to disable it at all. Maybe it makes sense do not copy file if you override DUMMY_IDENTIFIER with empty string, but this approach should be investigated and you still have no any garantees that any other plugin doesn't provide extra completion for your context. Essentially, since any plugin can provide completion variants for any file, it's not your business to decide that you don't want code completion; even if you don't have any completion variants, some other plugin may have. 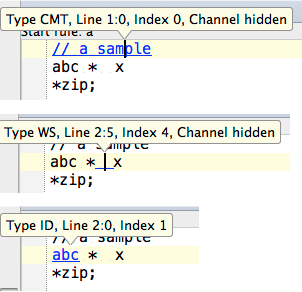 And the only way for IntelliJ IDEA to check whether it's the case is to create a copy of the file, add the identifier, and then query the registered completion contributors to see whether any of them match the context. Hi Dmitry, thanks. Yes,I can see how it cannot be disabled because other people may want it in their plug-ins. I have solved this whole issue after 10 days of banging my head against the internal parsing infrastructure by simply avoiding it completely and doing my own tooltips and text annotation. That only took a few hours ;) The infrastructure you have is excellent, though force fitting ANTLR into it has been challenging to say the least. This last problem of hooking in an arbitrary language over which I do not have control, proved too difficult so I simply re-implemented your annotation functionality for ANTLR parser stuff. The other infrastructure you have for pop-ups and hints and so on is very easy to understand so I just went that route.